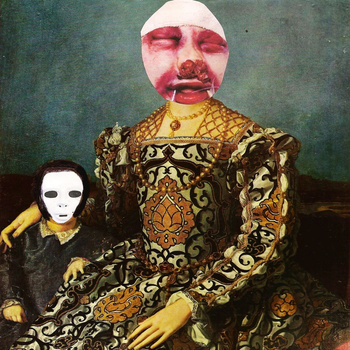 Yorkshire-born, London-based collage artist releases his seventh album. Louder Than War’s Paul Scott-Bates reviews. If the term ‘collage artist’ puts you off, don’t let it. Ashley Reaks isn’t an up-his-own-arse pretentious being, he’s a one-off, unique. They broke the mould. The superb Compassion Fatigue 1-8 sounded on paper like some arty-farty affair, but turned out to be one of the highlights of 2014. Reaks is now back with another quite brilliant collection of ten post-punk anarchic techno slabs like nothing you have heard before. Termed (probably by himself) as ‘the illegitimate son of Devo and The Cardiacs’, who are we to argue? The opener and title track launches straight into a highly charged, organised piece of eclectic fever which entices the listener to get involved from the off. Shouting and screeching with the now anticipated profanity thrown in for good measure as Ashley isn’t one for avoiding the odd bit of controversy. His art is original to say the least, and recent collages of Cameron and Thatcher in ‘compromising’ positons have induced reaction from many quarters. The house-dub of Wearside Jack is straight from the sound bank of Gary Clail as it frisks along with a dance beat, catchy vocals and stunted sax incorporating references to The Yorkshire Ripper adds to the overall effect. An appearance on The Dustman from Leonard Phillips of The Dickies evokes memories of the one minute classics Banana Splits and Eve of Destruction and the quite stunning vocals of Maria Jardardottir add a sexual ambiguity which maybe hasn’t been present before – Gleaming Cinders is stunning. Further guest work from wordsmith Joe Hakim on trip-hop Crystal and the poignant I Want To Get A Celebrity Pregnant and Kevin Boniface, Huddersfield poet and postman vocalises over the minute long Mr Barton And The Squirrels. The striking guitar work on both the title track and Hell And Back Again is provided by Nick Dunne, whose gritty sound adds a tour-de-force and fourth dimension to the already ballsy tracks. Ashley Reaks continues to be an incomparable talent and a true original, and like last year’s album Before Koresh promises to be present in the best of the year compilations. ~The Ashley Reaks: ashleyreaks.com. He can be followed on Twitter as @ashleyreaks and liked on Facebook.